Arizona Specialty Coatings are formulated and professionally applied to create a permanent barrier between your valuable equipment and the harshest elements found in man-made or natural environments. Polyurea coatings can be applied consistently and evenly in any direction, including overhead, regardless of the substrate size or shape. It is an ideal solution for commercial vehicles, fire trucks, trailers and heavy-duty vehicles; to name a few. With its exceptional anticorrosive properties, polyurea has been rapidly adopted for use in the repair of bridge decks, tunnels and road or bridge steel structures by transportation departments across the United States. Polyurea’s extraordinary strength, flexibility and abrasion resistance provides a clear advantage over conventional epoxy paint that is known to frequently and quickly erode in harsh outdoor environments. Fast-setting, polyurea is an ideal choice for line-striping and other transportation markings where service must be returned in just a matter of minutes. Public service vehicles such as EMS vehicles, ambulances, fire trucks and law enforcement vehicles must withstand rugged everyday use. Contact with the public in a variety of situation requires the utmost durability and sanitation. 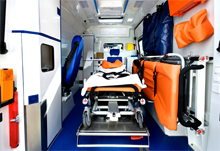 As with other chemicals and fluids, polyurea creates an impervious barrier to bio-fluids for EMS vehicle and ambulance floors. Bio-fluid contamination is easily cleaned without impact to the integrity of the coating. Running boards, step bars, ladders and other service equipment can be coated with a slip resistant layer that provides an extra safety measure for personnel during emergency services. Danger from electrocution working around or directly on overhead power lines is challenging even for highly-trained professionals. 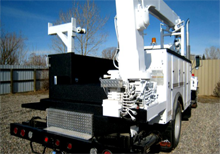 The boom truck, used to raise and lower the worker, can act as a conductor of electricity if it comes into with a live power line. As a non-conductive material, polyurea is highly successful at creating barrier to electrical conduction. Boom trucks coated with polyurea produce a grounding effect that can significantly reduce the danger of accidental electrocution.